Mass start, north on 3rd Ave then turn right (east) on to Laurier Street. Ride over the bridge (Columbia River) up the hill continuing on Athamere Highway through controlled traffic lights then turning south on to HW 95 south. Continue approx. 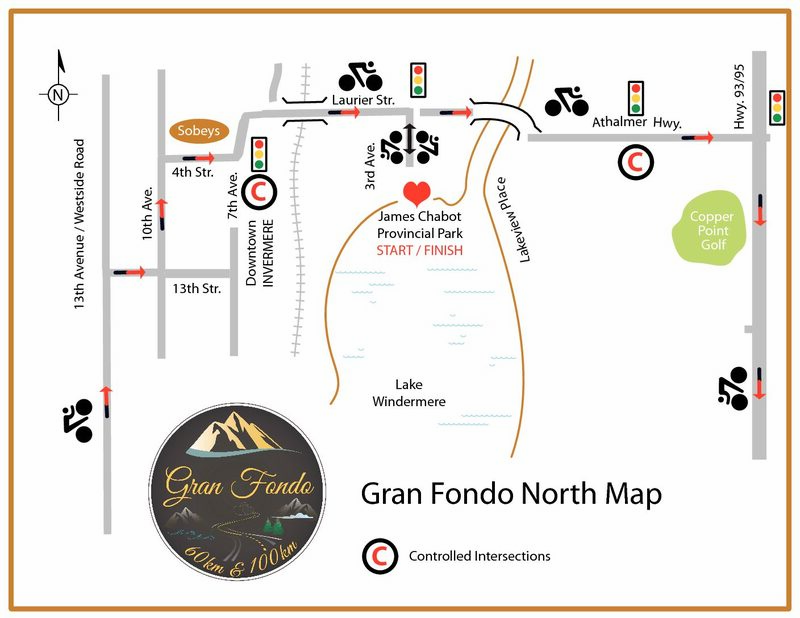 22km, past Fairmont and then turn right (west) on to Westside Road. Your first and only aid station will be available for food and water. 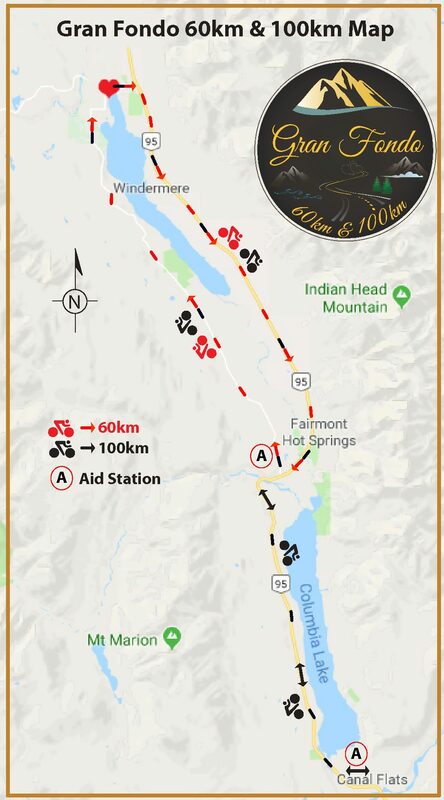 Continue north on Westside Road until you enter the town of Invermere approx. 25km on 13th Ave. Continue and turn right (east) on 13th Street and then left on 10th Ave (it’s all down hill from here). Turn right on 4th Street and the left at the controlled lights on to 3rd Street. Descend down to 3rd Ave watching your speed, turn right to finish line at transition zone in James Chabot Provincial Park. Please be mindful of other athlete traffic near finish. Mass start, north on 3rd Ave then turn right (east) on to Laurier Street. Ride over the bridge (Columbia River) up the hill continuing on Athamere Highway through controlled traffic lights then turning south on to HW 95 south. Continue for approx. 45km and then turn left (east) across traffic at Canal Flats on to Burns Ave. Immediately turn right on Pine Street, left on Willow Ave then left on Shaughenessy St. Your first aid station will be available with food and water. Turn left back on to Burns Ave and continue to HW 95 turning right (north) to return back to Invermere. After approx.. 20km you will pass the Hoodoos and turn left (west) across traffic on to the Westside Road. Your second aid station will be available with food and water. Continue north on Westside Road approx. 25km until you enter the town of Invermere on 13th Ave. Continue and turn right (east) on 13th Street and then left on 10th Ave (it’s all down hill from here). Turn right on 4th Street and the left at the controlled lights on to 3rd Street. 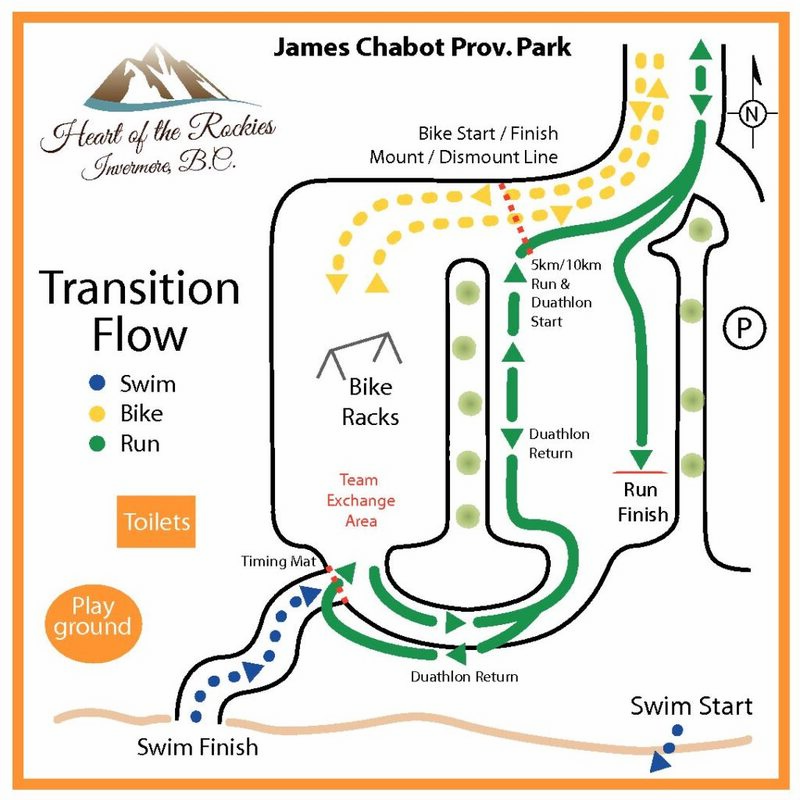 Descend down to 3rd Ave watching your speed, turn right to finish line at transition zone in James Chabot Provincial Park. Please be mindful of other athlete traffic near finish.